The roar of the engines on the chicane, was resonating loudly through the air from the world class Formula 1 circuit. You could hear it from a mile away and those on the circuit had earplugs on and cheered as their favourite drivers passed by on race day. The Sepang International Circuit beckons to sporting individuals. Everyone wants a go on it, from avid motor heads, motor cyclists, go kart fans, even those from sports sans engines like skaters, runners and cyclists. To take the numero uno grid Valentino Rossi does, to walk in the Ferrari team’s paddock or to take the turn into the pit stop, is every sport fan’s dream. 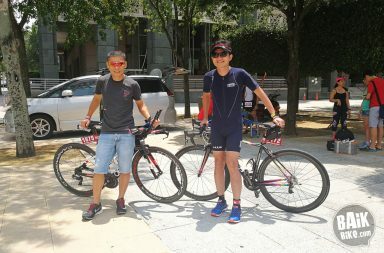 Pedalholic Cycling Club (PCC) junkies Kevin Phang(left) and Richard Lee were spotted on the starting grid! On a beautiful cloudy Saturday morning, Sepang International Circuit decided to open the track to non-motor sports, welcoming instead runners, skaters and cyclists. Families and friends, club members turned out in droves to experience the world class track in the name of building bonds and spending quality time together. Kids as young as 8 years of age were spotted pushing pedals gleefully, like kids play indeed around the 5.5km circuit. 8 year old Sophia was spotted pedalling a yellow bicycle with Angry Bird stickers. Daddy Ikwan would give her the ‘hand of god’ aka a pushing hand from the back whenever she had to climb the circuit. The imaginary crowd erupted in loud cheers when she approached the straight end of the lap. As we traversed clockwise on the circuit, the deceivingly flat circuit was not flat at all. Around the first two bends from the starting the grid, the climb already kicked into a monstrous slope, challenging the toughest of weekend warriors. The rest of the circuit would curve it’s way like a long anaconda chasing its tail, ending in the infamous hairpin bend around the grand stand. Everyone was enthusiastically taking photos at all nooks and turns. The hair pin chicane, the grand stand’s Hallmark flower-shaped roof, the starting straight were all recorded in photographs. Some bicycles were unceremoniously dumped on the sides while mass clumps of people congregated for their group photos, while others were fortunate to be given a spot in photographic memories. The width of the track was sufficient to accommodate both runners, skaters and cyclists alike, demarcated with cones at certain junctures. Respect was maintained throughout the course, with no altercations occurring. Parents kept their little ones in check, although it was obvious some parents had not ridden a bicycle in a long time, and couldn’t control their movements well. Para cyclist Sharifin from Shah Alam has only been using his hand-powered bicycle for a year, has managed to cycle two rounds the undulating circuit. A paramount effort indeed towards achieving a distance of 21km by September as he will be participating in the PJ Half Marathon. I jokingly said to him if he were to challenge me to an arm wrestle, I would lose undoubtedly. The chequered flag was waved earlier than expected, the track officials decided to cut short our time on the track by half an hour. Many dreams of beating the fastest lap time held by an imaginary Formula 1 car or MotoGP motorcycle (without engines) were blown to smithereens. Disappointingly, we were caught off-guard and cordoned off midway back into the starting grid. Hopefully proceedings shall be made known to everyone in advance on the next ‘track day’. It was an euphoric experience to be able to live out in real life, the scenes you normally only see on TV. From the couch to the pits and the starting grid, to grabbing that chequered flag, it’s an experience a sporting fan should do at least once be it on foot, or on wheels. Jyn loves travelling the world, cycling to explore new places and finding yummy eats in the smallest towns. Follow Jyn on Facebook or blog.